Anna Chumsky and Macaully Culkin wear optical white high top and black low cut Converse “Chuck Taylor” All Stars in the film. Thomas J., Shelley, and Vada observe the world from Vada’s front porch. Vada Sultenfuss (Anna Chumsky) is a precocious eleven year old living in a small Pennsylvania town during the early seventies. She wants to be a writer and has a crush on her attractive English teacher, Mr. Bixler (Griffin Dunne). She talks about life and spends a lot of time hanging out with her best friend, Thomas J. Sennett (Macaulay Culkin). But there is a certain amount of angst in her life caused by the environment and experiences of her family. Her mother died within two days of her birth, and so she feels guilt for her loss and sadness for growing up without a mother. She adores her father, Harry (Dan Ackroyd), but he is somewhat distant, and he runs a funeral home business right in their house. Due to the nature of his business, there is a continual flood of deceased townspeople coming through her home, and Vada is spooked when she has to go into the basement where the bodies are embalmed. One of her responsibilities is to watch her grandmother (Anne Nelson), who is silently suffering from Alzheimer’s disease, and the only sound she makes is when she suddenly starts belting out a Gershwin tune or some other hit from her youth. So much of the time Vada takes out her frustrations and lack of identity through a fantasy world of hypochondria, where she imagines herself on death’s door with various ailments. Vada stares at a class photo of her and her favorite teacher, Mr. Bixler. As the story of My Girl gets under way, some changes in Vada’s life are starting to take place. In response to Harry’s ad, Shelly DeVoto (Jamie Lee Curtis) a cosmetologist starts to work at the funeral home, and suddenly there is a mature woman in the house. Shelly has recently divorced her husband, and all she has left from that marriage is a trailer home in which she lives. For the first time in her life, Vada feels twinges of jealousy and resentment, because she is no longer the total center of attention in the Sultenfuss house. At the same time she is intrigued by Shelly, and her independent and spirited approach to life. When Harry and Shelly actually start dating, Vada is curious about their attempts at romance — after all Harry hasn’t been on a date in twenty years — and actually spies on the the two of them. Vada wants to experience romance herself, in her fantasy world of romance with her teacher, and in somewhat of a real way with Thomas J., who serves as her sounding board, companion, and eventually the object of her first kiss. Additionally, Vada is starting to experience puberty and through her writing and the changes in her family life is beginning to emerge from the emotional shell that she has been hiding in. As the film unrolls in the leisurely pace of the small town, Vada experiences tragedy, a loss of innocence, and finally some real emotional growth. How Vada and Harry respond to these events forms the bulk of the film’s story line. 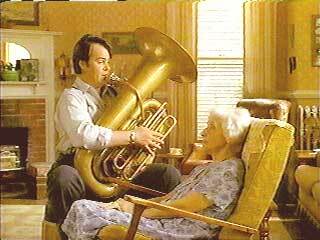 Harry plays the tuba for his mother, who suffers from Alzheimer’s disease. Director Howard Zieff and writer Laurice Elehwany have given us a simple and direct approach to the common theme of coming of age. While some of My Girl may seem contrived, you are quickly drawn into the personalities of the characters, especially the kids. The acting is especially fine in much of this film, and some care has been taken to develop each character. Anna Chlumsky pulls and tugs at the audience with the wide range of emotions that she expresses throughout the film. She is at various times precocious, conniving, romantic, rebellious, melancholy, loving, and emotionally drained (after tragedy strikes). Macauley Culkin proves that his success as a child actor is no fluke in this performance. Thomas J. is a very different personality from Culkin’s character in the Home Alone series — a sensitive owl-eyed kid who observes the world very carefully as he starts to emerge from his sheltered home life. You never sense that he is acting, and he plays his role with an intelligence and insight that makes Thomas J. one of the more interesting and realistic characters to appear in this genre. Jamie Lee Curtis portrays Shelly as uninhibited and worldly, but to her credit she doesn’t allow her part to become overbearing. She has had some rough times and is on the rebound from her recent divorce. Her motive in accepting the job with Harry is because she wants to experience family life in a small town. Shelly uses simple charm to help bring Harry and Vada out of their shells, and her presence seems very natural and healing. Dan Ackroyd’s portrayal as Harry, the amiable but introverted mortician, is miles away from his earlier comic roles like Elwood in the Blues Brothers films. Ackroyd allows Harry to be really square and “unhip” when necessary, but you always sense that there is some depth to his character, and he seems natural in the role of a small town widowed father. Thomas J. and Vada jump into the lake to escape the swarming bees. 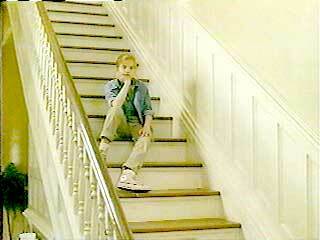 Vada contemplates her situation on the stairs of her house. Both kids in My Girl wear chucks. 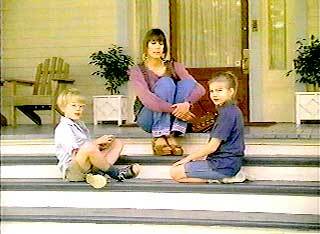 Vada wears white high tops in many of her scenes, which seems to fit her tomboy personality and lifestyle. Thomas J. wears black low cuts throughout the film, but not like a jock — he wears them with dark socks. There aren’t very many chucks closeups in the film, although you do sense their presence in many scenes. 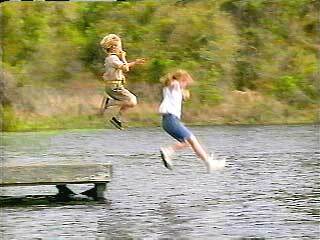 The most interesting action scene is when Vada and Thomas J. go running off of the pier and jump into the lake to escape a swarm of bees. Vada meditates with some members of her writing class. My Girl. (1991) Dan Aykroyd, Jamie Lee Curtis, Macaulay Culkin, Anna Chlumsky, Richard Mansur, Griffin Dunne. Directed by Howard Zieff. Categories: Drama, Coming of Age.